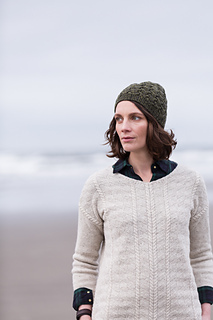 This featherweight interpretation of the gansey is entirely feminine and perfect for dressing up. 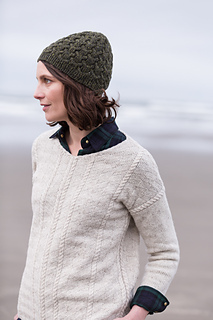 The slight A-line is embellished with flattering diagonals formed by small, simple mirrored cables and jaunty tilted blocks of purl stitches. 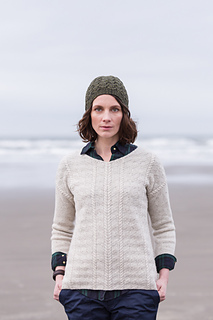 All pieces are worked flat from the bottom up and sewn together; a few stitches at the shallow V-neck form a cabled self-edging that’s grafted at the back neck and stitched in place for a quietly perfect finish. 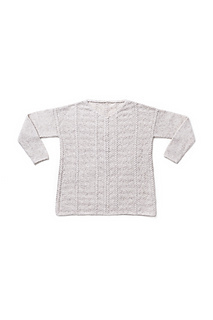 Modified drop shoulders delineated by cables yield an attractive detail at the upper arm; the bracelet-length stockinette sleeves keep the look simple and understated. 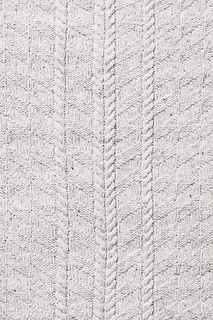 Vanora’s tranquil texture shifts will be shown to best advantage in a pale color. We used Fossil, but a soft hue like Postcard, Foothills or Bale will work beautifully, too. 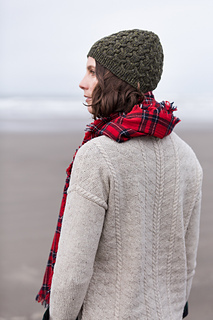 The hat shown in these photos is our Crag cap — click here to read more about this pattern.